4Media AVCHD Converter is a full-featured tool for AVCHD camcorder owners, which can convert AVCHD videos (MTS, M2TS, MOD) to common videos including AVI, MPEG, WMV, DivX, MP4, RM, MOV, XviD, 3GP, FLV, SWF, and HD videos like H.265/HEVC, MPEG-4 TS HD Video, MPEG-2 TS HD Video, Quick Time HD Video, WMV HD Video. Convert AVCHD videos shot by your Sony, Panasonic, JVC, Cannon camcorder to various formats with this AVCHD video converter. Most AVCHD camcorder or DV users may have the trouble with playing AVCHD videos (MTS, M2TS, MOD) on common players or portable devices. 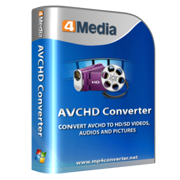 4Media AVCHD Converter is designed to help you convert AVCHD videos to popular videos like convert AVCHD to AVI, MPEG, WMV, DivX, MP4, RM, MOV, XviD, 3GP, FLV, SWF, and HD videos like H.265/HEVC, MPEG-4 TS HD Video, MPEG-2 TS HD Video, Quick Time HD Video, WMV HD Video. So you can enjoy self-created videos from your Sony, Panasonic, Canon, JVC, Hitachi AVCHD camcorder on iPod, iPhone, Apple TV, PSP, PS3, Zune, Xbox, iRiver and more multimedia players. Besides, this AVCHD video converter can extract audio from AVCHD video to MP3, WMA, AAC, WAV, CDA, OGG, FLAC, APE, CUE, M4A, AC3, MP2, AIFF, SUN AU Format, and capture AVCHD video image. 4Media AVCHD Converter also features the editing functions: trim video clips, crop video screen, add subtitles/soundtracks/watermarks/artistic effects, preview, take a snapshot and adjust preferences. Turn your AVCHD videos into common videos and HD videos with the broad supported video formats. Support many types of AVCHD camcorders: Sony AVCHD like Sony HDR-CX7E AVCHD 1080i, Canon AVCHD like Canon HG10 AVCHD 40GB High Definition Camcorder, Panasonic AVCHD like Panasonic HDC-SD9GK. Extract music and convert AVCHD video to audio formats like MP3, WMA, AAC, WAV, CDA, OGG, FLAC, APE, CUE, M4A, AC3, MP2, AIFF, SUN AU Format. Automatically capture any desired images from AVCHD videos and save them as JPG, PNG, GIF, or BMP format. Convert MTS, M2TS, MOD video to High-Definition videos including H.265/HEVC, MPEG-4 TS HD Video, MPEG-2 TS HD Video, Quick Time HD Video, WMV HD Video; convert AVCHD videos to common videos including AVI, MPEG, WMV, DivX, MP4, MKV, RM, MOV, XviD, 3GP, FLV, SWF. Powered with NVIDIA CUDA & ATI Stream technology, 4Media AVCHD Converter is able to convert videos in x5 faster speed. The AVCHD video converter lets you enjoy High-Definition videos on iPod, iPhone, Apple TV, PSP, PS3, Xbox, iRiver, Zune, mobile phone and other multimedia devices. Allow you to crop video playing area to remove black border, commercial logo or other else. Trim any desired parts of your video and output them singly or as a merged one; merge multiple video clips, audio files or pictures into a single one and even add transitional effects between the merged picture or video items. 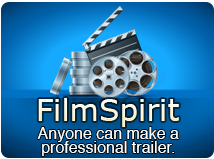 Equip your shot video or no-subtitle video with subtitle files. They can be comments, dialog, or other else you like; insert multiple soundtracks (up to 8) and output a multi-track video file. Enable you to add picture watermarks or text title onto your video; make your video professional with artistic effects like old film, snowflake, sand, mosaic. The video splitter helps you split a large file into several files in smaller size. Customize the split time or file size as you like. Provide various parameters to improve your video quality, including bit rate, sample rate, frame rate, codec, resolution, channel. Output multiple files in different formats at a time by adding multiple profiles for one source. Bitrate Calculator enables you to customize output file size you want and has the bitrate calculated for you. Preview AVCHD video files in the resizable player (allows you to switch aspect ratio between 4:3 and 16:9) and take a snapshot of your favorite movie images whilst preview and save them as JPG, PNG, GIF or BMP format. You can make the converter transfer the converted files to your iPod, iPhone4, iPad or PSP directly after conversion. Provide post-conversion actions to automatically perform shutdown, hibernate, standby or exit; run the AVCHD video converter in the background so that you can run other programs at the same time. 4Media AVCHD Converter supports multi-core CPU for multiple tasks and convert two or more files in batch mode at the same time with only one click.